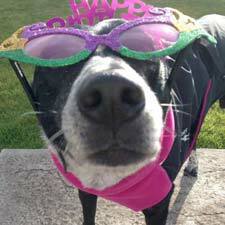 Tripawds Community member rikntracy is recipient #24 of the Maggie Moo Fund for Tripawd Rehab. 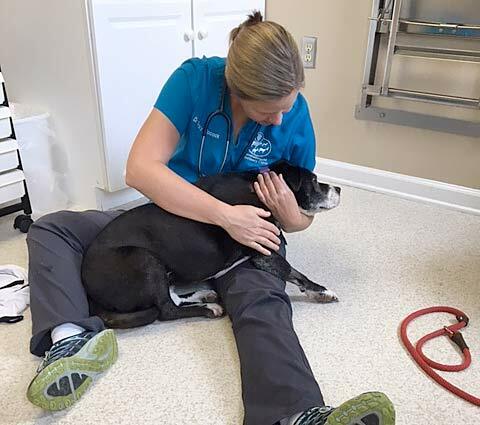 Read on for details about the benefits of Zato’s canine rehab evaluation. Zatoichi is an approximately eleven year old American Staffordshire Terrier who underwent a left foreleg amputation on June 26, 2017 due to osteosarcoma of the proximal humerus. 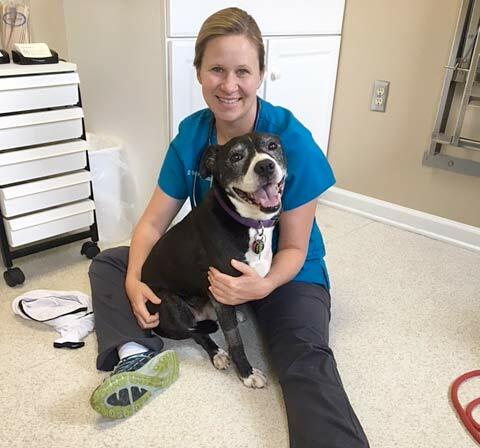 After an initially rough recovery, Zato was doing well by week four, and we decided it was time to have a rehab consultation to keep him strong and keep him from injuring himself with his new gait. Zato was adopted in 2008 and had the use of all four legs, and had good use of his left foreleg until he began limping in May of 2016. Another exercise is to get Zato to lie down and then crawl towards a treat. The purpose is to build core strength, which will help compensate for the increased weight on his remaining front leg. His front leg is now supporting 60% of his body weight. All of these exercises can be done for brief periods of several seconds, several times a day. The therapist also suggested taking Zato for several short walks during the day instead of one long walk. There was no underwater treadmill at the clinic, but Zato could also benefit from walking in water for brief periods, as this will exercise his joints while giving him some buoyancy so the exercise is a bit easier. He should enter and exit the water with a harness to help him feel more stable. The main thing I have taken away from our therapy session is that the removal of the leg is only the beginning of steps to ensure that Zato has a good, pain-free quality of life. By preventing injuries to the soft tissues and joints, Zato will move more freely and comfortably, and should have less arthritis. Yay Zato! Looking good you little Warrior! Thank you, Mascha! 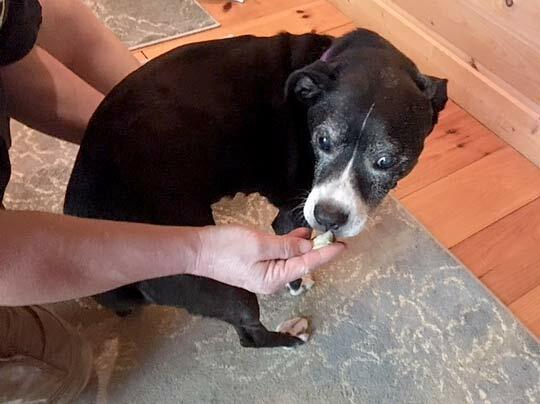 And we are so grateful to the Tripawds Foundation for helping Zato! Way to go Tracy & Zato! I am so glad that Zato got to start his PT and it sounds like you really learned a lot at your visit. He is so cute doing his stretching for cookie crunches and I love his little frosty face. What a precious boy. I will be interested to hear how you feel the exercises help his balance and endurance. I am just so glad to see him feeling better and I know you are too! Hugs and Cookie crunches to You, Zato and your crew. TRACY!!! Thanks for the great “tutorial” on some great exercises we can do at home and the “why” behind each one!